Doing the things that you need to do to get your business off the ground. Legal Business Edge prides itself in maintaining a small-firm feel by treating each case with care and consideration. Attorney Sarah DeBruin is a high-quality professional qualified to successfully help you with any business or intellectual property legal matter. No issue is too big or too small. Legal Business Edge can show you all your options and reach a satisfactory and successful solution. Growing a unique sports related business. Solving the problems of the business and marketing plan. ​360U was created to help softball players discover the most elite version of themselves. Our 360 degree approach is focused on skills-based development. This all-encompassing approach also incorporates integrated classroom sessions, situational strategies, and mental approach techniques that will best prepare softball players to experience success on the field and beyond. Commercial lending and the role of WBD in helping startup and growing businesses. WBD is a business finance resource that provides the knowledge, services and access to capital needed to create jobs, grow businesses and build communities. Learn about starting a unique business with an interesting “Business Model”. Helping people deal with “Life Changing Events” through individual, group and computer based counseling sessions. Providing the “Soft Skills” needed to help with recovery. 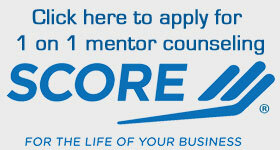 Also learn the background of our newest SCORE Mentor. Doing what you love and loving what you do. A great way to start a business. At Boogie Ballroom Dance Studio, our goal is to give you a break from the stressors of everyday life and give you an opportunity to laugh and dance some of the worries away. The first step is always the hardest to take. Whether you are preparing for a wedding, looking for a new hobby, want to ignite the spark in your marriage, or just plain want to BOOGIE down with a dance professional, we’d love to guide you on your dance journey! Jen is a curriculum writer, literacy specialist, blogger, teacher homeschool mom of 4 and more. She will be looking at how to use the internet and sociai media to grow you business.